The collection of historical firearms of the Historical Museum of Uruguay. The Opernbrunnen of Cologne by Jürgen Hans Grümmer. Inventory and concept of preservation. The stage settings of the decorative painter Brückner for the first performance of the opera Parsifal by Wagner in Bayreuth. Historical subsumption, restoration, presentation. Ways of conservation and restoration of a 17 th century cabinet. A thesis on how to deal with ivory engravings. Exemplary documentation for the plaster object of the electoral castel of Mainz. A Rococo pendule clock from the personal property of Frederick the Great. Examination of the condition, concept development and attempt of reconstruction. The northern portal of the Church of Our Lady in Trier. Investigation of the polychromy and natural stone. Considerations forhandling with the north portal. The coated wedding bed dated 1525 located in Eltz castle. Technological investigation of the structure and form, developing of a restoration concept. Conservation of the animation cels of the film “Plaste Color (II)”, 1968, Heinz Engelmann from the German Institute for Animated Film – polyvinyl-acetate and alkyd resin paint layer on cellulose-acetate Sheets / Concept for the preventive conservation of the animation cels from the German Institute for Animated Film e.V. "The Inkwell Madonna of the St. Maria Himmelfaht cathedral in Hildesheim." Technological examination and developmentof a treatment plan. Easy come, easy go. Production and deterioration processes of Celluloid, presented by selected examples of the West German Celluloid factory in Lank-Latum. Bronze Cast Bells. Aspects about the technology and conservation based on a baroque bell from Simon Urndofer (1650) from the parish church Zwettl. Starting your own business as a freelance conservator. An Indian Temple Chariot from the Ethnological Museum Berlin. Survey, restoration concept and options for the display of a large scale object. The relevance of the colonization from Stone with Trentepohlia sp. Investigation of manuscrips of the reformation time belonging to the library of research in Gotha having regard to long time conservation. Predefinition and emphasis of conservative criteria, wich require the decomposition of the binding. The Collection of Anatomical Wax Models in Vienna’s Josephinum Preventative Conservation and Long Term Maintenance Strategies. The tomb of family Braun, cemetary "Marienfriedhof", Hildesheim Registration and analysis of asset, condition and environment, as well as a proposal for the conservation of the tomb. Examination of the Condition of the Pastel "Bildnis J. W. Zschorn" in the Art Collection of the University at Göttingen. - Options for the Conservation and Restoration according to damage specific and aesthetic Criteria. A classicistic dressing table from the destroyed Rötha Castle. Technological and conservation investigations and development of a concept for restoration with partial experimental implementation. The crypt of St. Maria im Kapitol in Cologne. Salt-monitoring to facilitate long-term studies and restoration measures. Untersuchung und Vergleich von Aufbewahrungs- systemen für neuzeitliche Handschriftenbestände unter konservatorischen und raumsparenden Aspekten. Empfehlungen für das reformationsgeschichtliche Schriftgut der Forschungsbibliothek Gotha. Fragment of a ceremonial object from Papua-Neuguinea belonging to the collection of Kulturhistorisches Museum of Rostock. Findings of examination, concepts for conservation treatment and presentation. The analysis of lockers from the greater area around Braunschweig. Specialities of a regional type of furniture. Conservation of the oil-print “Taufe der Germanen durch Bonifatius” of the Bethlehemkirche Hannover Linden. Possibilities of the conservation treatment. The polychrome, late medieval Gethsemane sculpture group made of sandstone at St. Jacob’s Church in Rothenburg ob der Tauber. Investigation and recommendations for a conservation and restoration concept. A concept for preventive maintenance and preservation, which relates to the `Perltapetenzimmer´ of the Löwenburg in the park of Wilhelmshöhe in Kassel. Microbial analyses to the fungicide effectiveness of the treatment of defined laboratory paper with para-hydroxybenzoic acid alkyl esters solved in water. The Meridian House on Telegraphenberg near Potsdam – Development of a conservation and restoration concept and historical building requiry of the use of corrugated zinc in the 19th century. The Effect of radiation during 3D-Scanning to the alteration of plastics. “TWIN TOWERS?” THE WESTERN TWIN TOWER CONSTRUCTION OF THE PRIORY AND PILGRIMAGE CHURCH IN MARIA SAAL, 15TH CENTURY, CARINTHIA. ASSESSMENT OF THE HISTORIC STRUCTURE AND CONDITION OF THE EXTERNAL FACADE AS BASIS FOR THE DEVELOPMENT OF A CONSERVATION CONCEPT. Decor panels of glazed carved terracotta probably of the mausoleum Buyan Quli Chan in Bukhara/ Uzbekistan from the Museum for Islamic Art Berlin. Laminated metal threads in textiles of the twentieth century. Examination of a Filmcostume of Marlene Dietrich from the collection of Deutsche Kinemathek in Berlin. Survey of a fire-engine from the Hessian State Museum in Kassel, owned by the Museumslandschaft Hessen Kassel (mhk). Material consideration of sek. phloem of the Redcedar (Thuja plicata) on the example of a woven mat from the North America Collection at the Museum für Völkerkunde in Hamburg. Insights into the history of nail technology. The decontamination of the Linckian wood collection from the Natural History Museum Waldenburg - The application spectrum of existent and developing processes. Conceptual design of presenting the collection. Concept of preservation for the ‘Heilig-Kreuz-Kapelle’ Simmershofen. Casein - Possibilities for identification and reduction. Conservation basics for a sustainable development of a showcave. Thangkas in western collections out of a restorer’s view. Considerations and restoration concept by the example of a thangka of the Reiss-Engelhorn-Museen Mannheim. The late gothic sculpture of Madonna originally from Oesede monastery. Investigation and analysis of the polychromy with gilt copper mounting. Findings protection to the preservation and restoration of an oak-chest of 1688 from the Bad Münder Museum, as well as production of a presentation concept. A late gothic altar retable (from around 1490) and a neo-gothic altarpiece (from 1889 from the Evangelical Lutheran Church of St. George in Delligsen. Developing a conservation/restauration concept keeping in mind liturgical aspects. Developing a cadaster for Lehmbruck`s graphic work in the Stiftung Wilhelm Lehmbruck Duisburg. Application and exemplary restorations. Der Corpus Christi aus der St. Cäcilien Kirche in Everode: Technologische Untersuchung und Erstellung eines Behandlungskonzeptes. Documentation of current condition of a block recovery on the example of a Saxon cemetery in Immenbeck. Damages, causes and possibilities of damage limitation. Concept of preservation for the ‘Heilig-Kreuz-Kapelle’ Simmershofen. Possibilities of presentation of mural paintings. Lined and deformed, de-lined and flattened. Structural treatments on the textile support in context with the conservation and restoration of a painting by Jacob Jordaens(?). Holz und Licht: Eine Untersuchung der Farbveränderung der Hildesheimer Holztafeln durch Innen-Licht und eine Diskussion einer Methode zum Monitoring von Farbveränderung durch die Möglichkeiten der digitalen Fotografie. Marble of the Waldviertel – Deterioration and Conservation on the Example of the Funeral Monument „Schwarz-Kurz“, Zentralfriedhof Vienna, Old Jewish Cemetery Gate 1. Concept of preservation for the ‘Heilig-Kreuz-Kapelle’ Simmershofen. Recommendations regarding the stabilisation of climate. „Caturbhuja-Mahakala“ and „Gu-ru drag-dmar“. Conservation and technical study of two Thangkas from Nako, Himachal Pradesh, India as well as on-site preservation. Tree (1967) from Pavlos – a sculpture from acrylic glass. Investigation of the material and working process. Options of jamming and filling of damaged polymethyl methacrylate. Maceration at historical saline buildings in Lower Saxony. The conservation problem of salt loaded timber. The Spolien wall in the lapidaries at the Köllnische Park. Analysis of the current state and the damages, recommendations for conservation of the Spolien. Chrome tanned leather for conservation purpose - Comparative studies for durability and processability. Comparison of analytical determination for ancient papyrus of different find spots.Is there a context between soil properties of find spots, chemical contents and quality characteristic of papyrus? The Thermoluminescence method for caramic dating. Painted copper as part of the architecture in the calotte of the apse in the chapel of Türnich castle. Damage phenomena and considerations for conservation. Risk Assessment in connection with events in historical rooms by using the example of the smoking room in the castle of wernigerode. The late baroque stucco ceiling in the former ballroom of castle Heuckewalde. Investigation and development of a conservation concept. The Mural Painting Fragments of the Former Huysburg Chapel - Painting Technique, Damage Analysis and Report of a Lasting Conservation Concept. Concept for the presentation and transport packaging of a large-sized paper object at the example of the tessellate artwork carton Barbarossa. The influence of vacuum on wood moisture and the effects on refined and unrefined surfaces. The Camaieu-Paintings in the abbey in the south wing of the monastery Ottobeuren. 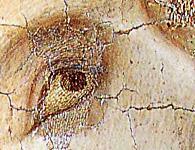 The problem of transformation of pigments on Secco-paintings. The memorial slab with the tomb effigy of Bishop Bernward situated in the Michaelis Church in Hildesheim. Examination of its status and constitution, creating a concept for the conservation and discussion on the presentation. The problems of the application of synthetic resins in conservation and restoration of wallpaintings. The wallpaintings in the choir of the church St. Marien in Salzwedel - a recent example. Analysis of the implication of gamma-rays on leather based book covers. The chapel of the manor-house Gamig around 1600. Analyses concerning the present situation and a concept for conservation and restoration. Historical transfer of a Gothic painting – Examination and proposal for the preservation of the “Holy City of Jerusalem” in St. Sebald Nuremberg transferred from wall to canvas about 1900. State capture in the approach of a short-term relocation of the paintings from the depot of the Roemer- und Pelizaeus Museum in Hildesheim. Production of a criterion catalogue to necessary conservation measures. The operation model of a carouselpalst by Paul Stephan from the Städtischen Museen Zwickau. Documentation of current condition and conservation concept. Late baroque, in fragments refound wall hangings out of the Stadtmuseum in Einbeck. Developing a concept to reapproach the condition. Georg Baselitz - Street Picture. Studies of Painting Technique and Condition. A technological examination of the application of photographic methods on paintings by means of six portraits of the Schloss Gottorf Foundation of Schleswig-Holstein Museums. Attempts to the sepatation of several layers of transparent mastic coatings. Artificial, naturally! Imitation of tortoise shell and ivory - possibilities of substituting with plastics, demonstrated on historic commodities with an aspect on the identification of materials. A small renaissance cabinet with applied decorative metal elements. Historical background, object analysis and treatment plan. The possibility to improvement the application of mineral-containing mortar to hydrophobic surface by a modified lime slurries. Testings of uncomplicated methods of analysing leather book-covers damaged by heat and the water. Exemplified by the inventory of Herzogin Anna Amalia Bibliothek (Weimar, Germany) under economic and preventive aspects. A shark tooth weapon and a cuirass of the I-Kiribati, made available by the Roemer- and Pelizaeus-Museum Hildesheim - A detailed description of the condition of the objects as well as a specification of concepts of renovation, storage and presentation. An upholstered armchair, style Louis Seize, from the Städtisches Museum Braunschweig. Development of a conservation treatment and reconstruction of the original upholstery. A storage concept for the oil-sketch-collection of the Lower Saxony regional-museum Hanover. An Early Islamic Wooden Panel Decorated with Mosaics in the Collection of The Metropolitan Museum of Art, New York: Technical Investigations and comparative studies on this and contemporaneous, closely related objects. Death, religion and restoration. Ethics and esthetics in conservation and restoration of sepulchral objects. A hearse, inventory number M 2006/65 from the spectral museum in Kassel. Creation of a comprehensive concept for the preservation and restoration and for the improved suggestions to the surrounding. An ivory inlaid table bureau of ebony. Investigation, formulation of a concept, restoration. The ballroom in the PRINZENPALAIS IN WOLFENBÜTTEL. Development of a concept for conservation and restoration of the mural and ceiling paintings (19th century) and its realisation in a pilot-test-area. A Swiss Dining-room Swite of the early 20th century- the Victim of a Flood Damage. A display cabinet as an example for possibilities of repair. The furnishing of the `Schöne Galerie` in the `Alte Residenz` of Salzburg. To the object`s report of surfaces and to the conservation of the wallpainting of Johann Michael Rottmayr (1711). Presentation of biogeneous wood pests in North and Central Europe regarding to habitat, damage symptoms and methods of combatting.- creation of a navigation system in an interactive form of a turntable for utilisation in conservation and restoration. Lasercleaning of common papers used in the 19th century in combination with typical writing substances. Decorative stencilled paintings in the area of Lower Saxony, Germany. Comperative Studies in the field of conservation. The present Bachelor-Thesis deals with the miniature collection of the Museum of Hamburg's History,including an inventory control and the developement of a warehousing concept. The paintings of Franz Radziwill - A painting technique examination of chosen paintings of Stadtmuseum Oldenburg. Deterioration on the Stone substance of the Hubertus Chapel in Sehlde/ Bockenem. Consolidation of gypsum containing masonry with mortar. Solutions for the continious usage of historical rattern-web chairs from the patient's rooms of Dr. Barner's sanatory, Braunlage/Harz. The development history of painting micro-climate showcases from the beginning of the 20th Century to the present. A presentation of different systems and materials based on literature and current examples. The Minerva-Mosaic (1873), Stubenring 3-5, 1st district, Vienna. Examonation, technology and conservation of mosaicglass and metalleaftesserae. The Church St. John the Baptist. Investigations of surface cleaning in consideration of microorganism. A shield from the lower Sepik river in New Guinea, owned by the Roemer- und Pelizaeus-Museum Hildesheim. A physical structure analysis, generation of a conservation concept and a presentation concept.